Displaying 1-50 of 259 items. Recently covered by Hilary Duff on her Santa Claus Lane album, the quickly-learned harmony of this Paul McCartney classic is a perfect last minute concert addition.Available separately: SATB, SAB, SSA and ShowTrax CD. Performance Time: Approx. 2:30. Celebrate Christmas the aloha way with this cheerful classic recently covered by Brian Setzer and his orchestra complete with ukuleles and Hawaiian guitars! A delightful change-of-pace! Available separately: SSAB, 2-Part, ShowTrax CD. Duration: ca. 2:15. Available separately: SATB, SAB, 2-Part, ShowTrax CD. Duration: ca. 4:50. This adorable vintage holiday song was recorded by Gene Autry and will make an incredibly cute addition to your holiday programs! Great for props and choreography! Mixed and men's groups will love this rock 'n' roll holiday classic, recorded by Chuck Berry and more recently by country artist Luke Bryan. Great for featuring a guitar solo and adding choreography! Santa's reindeer are bringin' down the house this year with their funky music, rhythmic rap, and hip-hop moves! A hip, hot novelty number with super-fun choreography available on the DVD! Featuring five gems from cherished Rankin and Bass animated Christmas specials, this this five-and-a-half-minute medley is holiday nostalgia at its best! Children one to one hundred will delight in this nifty novelty number with vintage appeal. You'll love the fresh feel of this delightful jazz waltz that comes alive with the joys of the season! A perfect opener for your winter concert, this arrangement is quite singable and will add the perfect touch of nostalgia! Available separately: SATB, SAB, 2-Part, ShowTrax CD. Duration: ca. 2:00. Recorded by Linda Eder, this heartfelt arrangement of a song by Frank Wildhorn expresses all the wishes and hopes for the holiday season. Great for both concert, pop and jazz ensembles!Available separately: SATB, SAB, and SSA. ShowTrax CD also available. Performance time approx. 3:45. Kermit the Frog and Camp Broadway brightened everyone's spirits in the Macy's Thanksgiving Day Parade with this tender ballad that will bring a touch of wonder to your holiday concerts and is perfect for school and community performances! Yes, miracles can happen if you just believe! Available separately: SATB, SAB, 2-Part, ShowTrax CD. Duration: ca. 2:15. An ideal finale, this stunning setting is sure to become a standard in your holiday concert programming. Available: SATB, SAB, 2-Part, Concert Band, ShowTrax. Performance Time: Approx. 3:55. These delightful Gaelic-flavored settings, including The Wexford Carol and Suo Gân, are fresh, airy and unique. Instrumentation includes optional Celtic instruments which can be effectively performed on recorder, violin, guitar and bass. Available: SATB, SAB, 2-Part, Instrumental Pak, ShowTrax CD. Performance Time: Approx. 3:20. Audrey Snyder : Do You Hear What I Hear? A Christmas classic in an accessible setting that is an excellent choice for elementary and middle school performers. Available: 3-Part Mixed, 2-Part, ShowTrax CD. After a rubato introduction, this original picks up the pace with a playful rock and roll take on jingle bells that will put a sparkle in your season and a twinkle in your eye! Great fun for choirs and audiences of all ages! This sparkling setting of three traditional carols makes a marvelous opener for all types of Christmas concerts. Easily-learned and easy to sing, your singers and audiences will be delighted! Includes: Angels We Have Heard on High, Hark! The Herald Angels Sing, It Came Upon the Midnight Clear. This beautiful song recorded by Andrea Bocelli can be performed any time of year, but the hope-filled lyrics are especially uplifting for December concerts. A ray of hope flickers in the sky, a tiny star lights up way up high. All across the land dawns a bright new morn. This comes to pass, when a child is born. 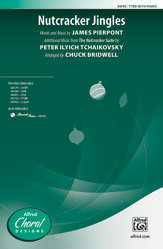 Available separately: SATB, Chamber Orchestra score and parts (fl, ob, hn 1, 2, perc, pno, vn 1, vn 2, va, vc, b), ShowTrax CD. Duration: ca. 2:40. Two treasured Christmas melodies are artfully paired in this setting of What Child Is This and The Coventry Carol. Perform it a cappella or accompanied with piano and optional bass and obbligato melodic instrument or guitar. Available separately: SATB, SAB, SSA, ShowTrax CD. Duration: ca. 2:30. This lilting original sings of the light from a shining star that illuminated the manger on a Christmas night long ago. The expressive legato melody and sweet, gentle lyrics including a short Latin phrase puer natus est, hodie Christus natus est will be easily learned by younger choirs. Available separately: 2-Part, ShowTrax CD. Duration: ca. 3:15. Ring bells! This traditional Ukrainian song is transformed with new music and text for a spectacular showcase for SSA choirs. With piano, bells and percussion. Recorded by Barbra Streisand, this ballad recounts all the joys of Christmas in a warm, jazz-inflected setting that will set the perfect holiday mood for all types of programs! Singing carols, stringing popcorn, making footprints in the snow, - sweet Christmas memories for all! Here's a jazzy, swingin' take on an old holiday favorite. The surprise pauses and clever orchestration make this the perfect novelty or concert closer. Perform it with piano, Showtrax CD or the optional chamber orchestra for extra holiday sparkle! Available separately: 2-Part, Chamber Orchestra score and parts (fl1, fl2, ob1, ob2, cl1, cl2, bn1, bn2, hn1, hn2, timp, perc1, perc2, str:88442), ShowTrax CD. Duration: ca. 2:25. It's "Jingle Bells" . . . it's The Nutcracker. . . it's great fun . . . it's "Nutcracker Jingles!" Festive frivolity abounds in this clever medley combining a favorite winter carol with the tunes from Tchaikovsky's most famous ballet. A crowd-pleaser! Add a little country twang to your holiday concert with this Christmas tune from Dolly Parton. The optional audience participation will have everybody singing and smiling. Available separately: 2-Part, ShowTrax CD. Duration: ca. 2:35. Walt Disney's Mickey's Christmas Carol brings us this joyful seasonal salute. From bells ringing to frosted window panes, this song is easily-learned and will put everyone in the holiday spirit!Available separately: 2-Part and ShowTrax CD. Performance Time: Approx. 2:00. Just because it's almost Christmas is no reason to stop honing your solfege skills! Keep the learning going with this delightful setting of Jingle Bells in solfege. If Santa can do it, then so can your students! Available separately: 2-Part, ShowTrax CD. Duration: ca. 2:00. The crisp sounds of a horse-drawn sleigh galloping through the snow set the mood for a winter frolic! This delightful showcase for young choir will be perfect for winter and holiday programming! Here's the famous Gene Autry holiday classic with a little updating for 2000! Includes a cute rap chorus along with the endearing original lyrics. Available: 2-Part, ShowTrax CD. Performance Time: Approx. 2:30. All is merry and bright indeed with Gene Autry's famous song from 1947. A great Christmas showcase for younger choirs!Available separately: 3-Part Mixed, 2-Part and ShowTrax CD. Approx. Performance Time: 1:45. Add some rhythm and energy to the holiday season with this popular Latin American Christmas song by Venezuelan musician and composer Hugo Blanco. Arranged by David Giardiniere for easy two-part singing, Mi Burrito Sabanero also includes parts for two violins and a few solo opportunities for your young singers. Add some percussion or use the spicy StudioTrax CD to turn up the heat at your holiday concert this year. Perfect for jazz and concert choirs, this fresh setting of the traditional French carol works well as a jazz waltz. Sing with a smooth, mostly straight tone to stay in the pocket and clinch the style. Super cool. Three cherished carols are incorporated into a lovely 4-minute Christmas medley for your whole music department. Perform this classic-sounding choral work with any combination of piano, concert band, or full orchestra accompaniment. A main event for holiday programs. Four treasured carols from Wales, England, and Ireland comprise this colorfully arranged Christmas medley (three-and-a-half minutes in length). The slow-fast-slow-fast form is carefully constructed for choir alone, band alone, or a combined performance. An elegant and timeless treat for the holidays. Selected by the USO as the theme song for their Operation Care Package campaign to support armed forces overseas, this emotionally-charged message is a welcome gift to all of us.Available separately: SATB, SAB, SSA and ShowTrax CD. Performance Time: Approx. 4:00. The cold wind may be blowing but your audience will feel warm and cozy with this medley of all-time great standards. Includes: Button Up Your Overcoat, I've Got My Love To Keep Me Warm, Let It Snow! Let It Snow! Let It Snow! Available: SATB, SAB, 2-Part, Instrumental Pak, ShowTrax CD. Performance Time: Approx. 4:20. Two of the all-time favorite Christmas selections combined in a fresh, creative setting! Ideal for any age level choral performance. The CD accompaniment adds a very special pizzazz to these perennial favorites. Available: SATB, SAB, SSA, 2-Part, ShowTrax CD. Rhythm parts available digitally (gtr, b, dm). Duration: ca. 3:05. This 6-minute medley will be a joyful finale for your holiday program. It includes O Little Town of Bethlehem in a gentle 12/8 feel, followed by the favorite spiritual Rise Up Shepherd and Follow, Away in a Manger, and a majestic setting of Hark the Herald Angels Sing. Easily learned and impressive sounding, optional brass add to the festive nature of this work. This festive, bright and fun mini-medley of Christmas carols is ideal for many holiday occasions. Scored for piano, flute and percussion, it is easily learned in a short amount of time. Includes: Sing We Now of Christmas, Pat-a-pan, God Rest Ye Merry Gentlemen. Available: SATB, SAB, SSA and ShowTrax CD. Performance Time: Approx. 2:00. Originally performed by CeCe Winans, The Christmas Star tells the beautiful story of this favorite season. Lojeski at his best! Available separately: SATB, SAB, SSA and ShowTrax CD. Performance Time: Approx. 4:30.